New reports from unnamed supply chain sources claim that difficulty in production of the Face ID sensor suite has held up production of the iPhone X so much, that Apple is only going to get about 20 million units delivered before the end of 2017. The Nikkei Asian Review claimed in a report on Tuesday that "problematic parts" associated with Face ID are the culprit to fewer iPhone X for fiscal year 2017. The report goes on to claim that OLED problems were wrapped up in July, with the face authentication system causing supply problems after that. The account also alleges that improvements in yield of the sensors only increased towards the end of September. As a result, the unit is being produced at a rate of 10 million units per month —which leads towards the Nikkei Asian Review's prediction of 20 million. However, the number seems to assume that Apple has only in the last few days started cranking out that volume, leading to that 20 million number. Other reports from the supply chain in recent days have suggested that while the Face ID sensor was the culprit of slower than expected production, and that the issues were resolved in late September, Apple's manufacturers are expected to crank out 30 million to 35 million units before the end of 2017 —which makes more sense from a mathematical standpoint. The publication gave itself an out, however. The report claims that Apple has already started negotiations with other manufacturers for "certain parts," and notes that there is a possibility that output volumes could increase rapidly. It is not clear how the constraint expected on the iPhone X will compare to the shortages of the iPhone 7 Plus at launch —which was reportedly held up by the dual-camera assembly. 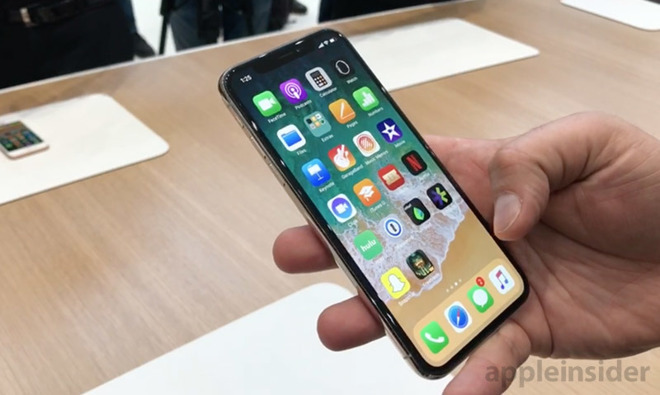 Apple's iPhone X debuted on Sept. 12 and has a 5.8-inch Super Retina OLED display, the A11 Bionic processor, and the apparently hard-to-produce 3D-sensing TrueDepth camera at the core of the Face ID technology. The device ships Nov. 3, and starts at $999 without any promotions.